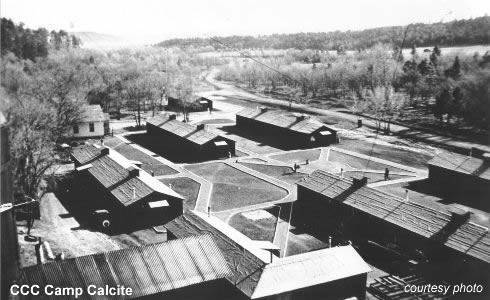 The buildings in the camp included six 50-man barracks, mess hall-kitchen, garage, tool and machine shop, forestry quarters, old bunk house used as a hospital, old house used as foremen's and officers' quarters, and the old lime kiln. 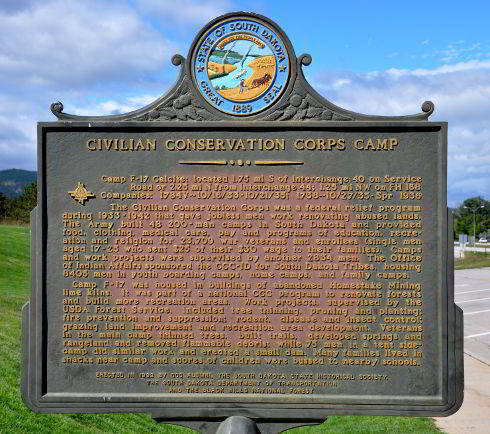 It was occupied by a CCC Company composed of WWI veterans from October 16, 1933, to October 21, 1935. Company 1784V was the only CCC company to be stationed at Camp F-17 (Calcite). It was organized on June 16, 1933, at Fort Meade, by three regular army officers and three non-commissioned officers (1934). Until June 27, when the first assignment of veterans arrived at Fort Meade, the company was composed entirely of casuals rationing with the company. The cooks were also from the casuals until the veterans arrived, when all but two were replaced from among the veterans. A headquarters section was formed on June 28 and was functioning smoothly by the time the last arrivals came on July 5 (1934). The veterans were immediately put to work policing and remodeling at the fort. Men of all trades were available, but the greatest demand was for painters. Among the tradesmen were carpenters, plumbers, linemen, cat-skinners, and engineers (1934). Part of the company left for Watertown on July 12, and the remainder left on July 17. While the company was on the Sioux River and Lake Kampeska, plans were made to build a permanent camp. However, plans were changed abruptly, and on October 15 the men entrained for Camp Calcite, arriving at Tilford on the morning of October 16 (1934). Several years earlier the Homestake Mining company maintained a thriving "side camp" at Calcite to produce lime for their kilns. This camp, locate one mile off the highway between Rapid City and Sturgis, had been completely abandoned (1934). When it was learned that the Black Hills Forest was allowed new winter camps, the Homestake Mining company made a "free use" offer of their old camp as a site for a CCC camp (1934). Unlike the younger men, the veterans were allowed to be married and have families in camp. Tragedy struck at Camp Calcite in January 1935. A school bus carrying camp children collided with a molasses truck and killed six children, another died a few days later. Camp F-17 was housed in buildings of abandoned Homestake Mining lime kilns. 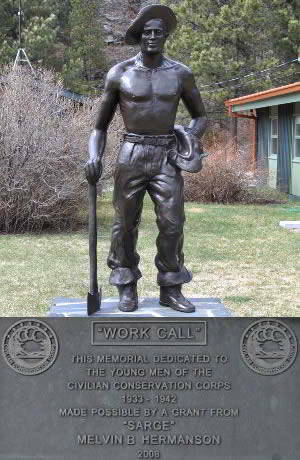 It was part of a national CCC program to renovate forests and build more recreation areas. Work projects, supervised by the USDA Forest Service, included tree thinning, pruning and planting; fire prevention and suppression: rodent, disease and insect control; grazing land improvement and recreation area development. Veterans in the main camp thinned trees, built trails, developed springs and rangeland and removed flammable debris: while 75 men in a tent side-camp did similar work and erected a small dam. Many families lived in shacks near camp and scores of children were bussed to nearby schools.